I am getting too old to be up all night. Harry is in the hospital again. Eleven more minutes I can call and cancel his appointment for today. Then I can go to sleep. Whatever the health issue, Sue, I hope Harry is soon on the road to recovery. We had ice all over this morning. Evidently, the roads are fine, but my car is covered. The man I was fortunate enough to marry is out cleaning it off so I can go play cards. Kathy, what a guy you got (I just got back inside from clearing the snow and ice from the Mrs. carriage). 37degF outside, according to my smartphone. Not gonna venture outside in the near future, if possible! Everybody!! Mark missing in action?! Was 34 deg F here this am. Ice on the car windows. I'm retired so don't have to worry about clearing window. Just staying in with a cup of coffee, playing games, etc. Morning. Our cars are in the garage, so we don't have to scrape ice, either. Morning all, miss Emily is now a a young lady. Should be some good times for this easy puzzle today. Sue, sorry to hear that Harry is in hospital again. Nice photo, but wish we had a better view of the kangaroos! 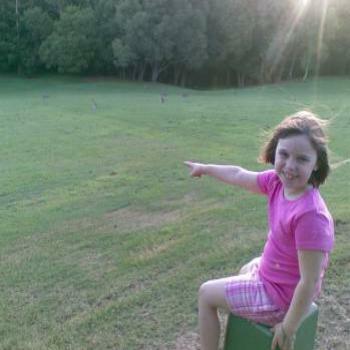 Yes, Jacalmi, the kangaroos were in the distance. Whenever she would visit, I would have to take her out to find kangaroos. Now she is 17 and more interested in her iPhone! Sigh! Brightened my day to see this pic flash up. Raining here and snow expected in the highlands - It's February, for goodness sakes! 1:49 Good morning one and all! Keith, I'm sending good wishes to you as we approach # 22 - bet someone will amble upon the opportunity and pounce! Peter! Keith just took a hit to his you-know-whats, and you STOLE his special number??? Shameful! Hope all went well, Keith. But I do hope he's OK! Judy. All went well. Only 24 treatments to go. Fleeting visit. Removalists on Thursday to take to storage and we should have a final clean in the arvo after they leave. Only 30 divorce commencements so far I'm currently in trouble because she told me to leave things alone and go and play on my computer. I did but that is apparently wrong! It's a tough gig, Arachnid.....being a bloke! Good maeN, good people. I was in bed and suddenly realized I hadn't yet sent my answers to Wombat. That is now taken care of, so I am ready for . Number 33 has just popped up. Before Peter or Rage or anyone else grabs it will do so and imbibe a Hahn Light. I've put some money on the bar, so get yourself a libation. I.m glad that your first treatment well Keith. Do they give you weekends off? Very generous Rage. I'm sure the barman has a VB iced enough to meet your taste. It is time to turn the page which I will be very happy to do.